The novels of Andrew Vachss are known for their hard-core, gritty content and for his character, Burke, a no-nonsense anti-hero. The twelfth book in the "Burke" series is called Dead And Gone. Vachss told CBS News Early Show Anchor Bryant Gumbel that he would mainly describe his books as honest. "I'm not amping it up. If I had a wish, it would be that what I had to write about was fictional," said the 57-year-old author. In Dead And Gone, Burke is offered a job to deliver a ransom for a child who was kidnapped 10 years ago. The swap turns out to be a trap, and Burke and his beloved dog, Pansy, are shot by unknown gunmen. Vachss says that in this novel, readers see a side to Burke that they haven't seen before. "You see Burke as a child institutionalized, which is something you didn't really see before, and how his view of the world was formed, says Vachss. His novels always center around the protection of children, specifically children who are abused, some of them sexually. "I absolutely believe that child protection and crime prevention are one and the same," says Vachss. He explains how children's welfare came to be his all-consuming passion and preoccupation. "I was a federal investigator in sexually transmitted diseases. Unlike the way most people discovered child sexual abuse, in a media context, in argument about whether it's exaggerated, I saw babies dripping in gonorrhea," recalls Vachss. "I have been hot after predators ever since that time." He also works as an attorney, and he only represents children. Vachss' work experiences provide the material for his novels. "I don't need any research," he says. That's because after Vachss worked as a caseworker for the New York City Department of Welfare, he ran a maximum security prison for violent youths. Then he went to law school. He decided to write about what he witnessed "because I don't have a TV show, a radio program. I'm a working-class boy in America. A book would get a bigger jury than you get in a courthouse." Burke is not your typical literary hero. He's an ex-convict who lives on the fringe of society. I had to make him part of it instead of somebody investigating it." Vachss and Burke have a lot in common. "We have the same taste in women, in music, in automobiles and in dogs," says Vachss. Both men have the same politics and social outlook. 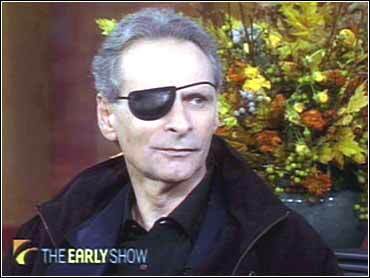 Burke is even wounded in one of his eyes, as was Vachss when he was seven years old. But Vachss says that's where the similarities end. Vachss denies that Burke is his avenging angel, and says he wouldn't want to do what Burke does  chase down bad guys and punish them. his methods of expression are much more limited than mine are." In Dead and Gone, Burke, who usually lives in New York City, has moved west. But Vachss says this is temporary. he's presumed to be dead, and it's to his tactical advantage to be off the streets. But he'll be back," he says. After people have read his book, Vachss hopes people will be angry. You have two people running for president of the United States, not one mentioned child protection." Vachss gets a lot of feedback from his readers, some of whom have been moved to action. "I get just really a ton of mail, especially at the website," he says. "People say they have done things and some of those things we have been able to verify. I'm gratified with the results." Interestingly, Vachss says he doesn't think of himself as a writer. "A writer would be somebody you can give an assignment to and would produce the material. I have one song to play. I'm trying to play it perfect until I get it right, but I don't have that range," he says.